I had no idea last week that there would be so much buzz about filling the freezer with breakfast foods. Prepping meal components ahead of time and freezing them or freezing whole meals has been the not-so-secret method of many a Mom to keep their cool at suppertime. It makes meal planning and dinnertime so much less of a hassle. And let's face it, if Mom is not hassled, then she's happy and if Momma is happy, everybody's happy - nothing more perfectly practical than that. 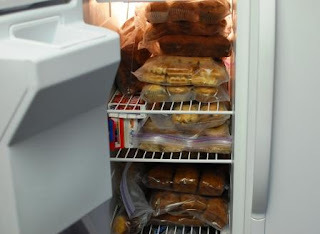 But as you saw last week, I don't just use the freezer for main meals; I keep baked good in there all the time as well for breakfasts, snacks, and the cookie ministry. Freezer cooking, batch cooking, make ahead meals, whatever you want to call it, is great for several reasons. A stitch in time saves nine, right? Well a meal in the freezer gives Momma a breather. (Benjamin Franklin I am not.) The point is, the extra few minutes it takes to double tonight's dinner or to throw that chicken you found on manager's special in a freezer bag with some barbecue sauce will save you considerably longer another night when supper needs to be on the table. Those few minutes are time well spent if you know that you are going to be short on time on a week full of company, late nights, various activities, and lessons. What goes into the freezer does not have to just be for supper; I know several people who make up breakfast burritos ahead of time and freeze them. I'm sure we've all done it, stood in front of the fridge or freezer with the door wide open - cold air blasting us in the face while we ponder what we could throw together for dinner. All the while, your electricity meter is happily whirling away. If you don't have a back-up plan for dinner, then it is all too easy to go out to eat and consequently, cost you money. Plus, the extra detergent, lotion, etc. as well as the aforementioned extra electricity and water are not factors if dinner is already made and only needs to be thawed. 4. It saves your health. 5. It saves your sanity. After a particularly busy day, the last thing I want to be confronted with is 20 minutes before we need to eat and no time to make what's on my menu plan. If I have something in the freezer, that is no problem. How many times have you been called from a church, school, or civic committee asking you to bring a casserole or some cookies to an event? I get those calls fairly frequently. On top of being prepared for those kinds of spur of the moment type needs, I try to keep a drawer of baked goods that can be pulled out at a moment's notice for company or gifts. There is no stress about buying goodies since I already have them on hand. There you go. Five good reasons why you should consider make-ahead food as part of your life. Don't forget to check out the Carmex give away! This is part of We Are That Family's Works for Me Wednesday & Raising Homemakers. I love to double up on cooking dinner. The extra meatloaf I made last week will make tomorrow night's dinner a breeze! Howdy Ms. Amy! Doubling up on dinner is a fantastic way to fill the freezer. Thanks for stopping by! I've got to get some breakfast things in my freezer, just as soon as I clean it out and make some room in there. Right now it's like a nightmare game of Tetris.